Villa Amarapura is a grand 7-bedroom holiday retreat found within the exclusive luxury resort of Cape Yamu on the eastern coast of Phuket. The villa is a real glamorous holiday haven and it enjoys terrific views over the Andaman sea. 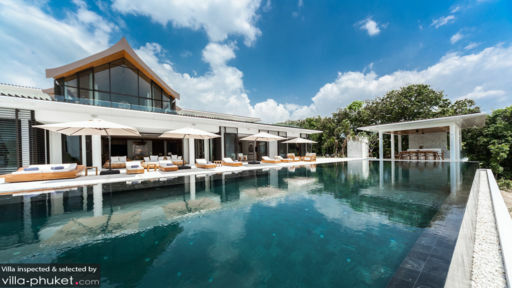 With traditional Thai architecture, refined interior designs, 2 stunning infinity pools, jacuzzi's and state-of-the-art entertainment facilities, guests staying at villa Amarapura are in for an amazing holiday indeed! The villa houses two luxurious, fully air-conditioned master suites, fitted with super king-size beds, Apple TVs and comfy day-beds for lounging with a good book. One of the rooms has direct access to the pool-deck where you can soak in the Jacuzzi and the other room enjoys terrific ocean and garden views. The en-suite bathrooms beat it all, boasting large circular bathtubs and double rain-showers. There are 5 more luxurious bedrooms in the villa, 3 king-bedded and the other 2 fitted with twin beds. All of the rooms feature air-conditioning, Apple TVs, generous wardrobe spaces and private en-suite bathrooms with bathtubs. Full bathroom amenities including bathrobes, slippers, hair-dryers, soap and shampoo are provided. All rooms enjoy great views over the garden, pool and/or ocean and one of the rooms even features a private sun-deck with two sun-loungers for enjoying some quiet time. Villa Amarapura is surrounded by lush tropical greenery and overlooks the breathtaking azure blue waters of the Andaman Sea, setting the perfect peaceful ambiance needed to unwind completely together with your loved ones. The estate features not 1 but 2 glorious infinity swimming pools, one on each level of the grand double-storey pavilion. Its is an amazing experience to dip into the crystal clear water of the pool and relax on the in-water double sun-loungers, gazing at the view of the ocean and distant mountains. On the sun-deck there are lots of sunbeds shaded by large blue parasols, soothing both those wanting to tan and those wanting to read. Alternatively guests can soak in one of the two Jacuzzi's for the ultimate holiday luxury feel. The upper deck is bordered by a glass protection fence and there is a gazebo with a sunken sofa lounge, perfect for enjoying sunset drinks in the afternoon. The smart living spaces are designed in ways to make the most out of the breathtaking ocean view. Guests can choose to dine alfresco style by the pool or indoors at the formal dining table, illuminated by a gorgeous chandelier. The pavilion is designed elegantly with handsome teak wood, tasteful artwork and comfy sofa's. Modern amenities and entertainment facilities are also provided. There is a cinema room with projector and screen for watching movies together,, a classy bar lounge to enjoy drinks to the music playing from the iPod dock and there is a private gym on-site for those wanting to stay in shape. On top of that, there is also an entertainment room, boasting a pool table and a high-tech Golf simulation game, entertaining young and old throughout their stay. A professionally trained staff of five, including a full-time excellent chef, makes staying at villa Amarapura even more perfect. There is daily housekeeping, personalized butler service and full time security. 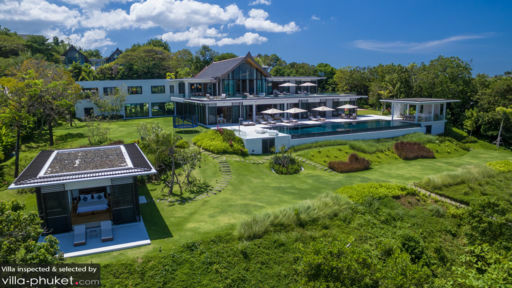 The Cape Yamu resort also features a tennis- and basketball court, free to use for guests staying at villa Amarapura. 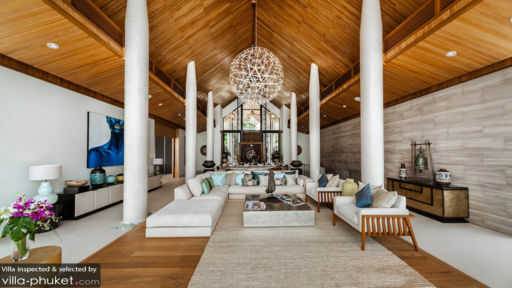 The villa is located on the serene eastern coastline of Phuket island, surrounded by tropical landscapes and bordered by the ocean where guests can so kayaking, swimming, snorkeling and diving. A supermarket is found at 7 km from the villa and the international airport is 27 km away.